Does route of administration affect the outcome of TNF antagonist therapy? The tumor necrosis factor (TNF) antagonists are parenterally administered biologic response modifiers indicated for the management of rheumatoid arthritis. Although infliximab, etanercept, and adalimumab are all members of this class, they differ in route of administration and dosing regimen. In the USA and in Europe, infliximab, in combination with oral methotrexate, is administered intravenously, initially at a dose of 3 mg/kg at weeks 0, 2, and 6, then every 8 weeks thereafter. The US Food and Drug Administration (FDA) has further approved that the dosage can be increased to 10 mg/kg and the doses can be given as often as every 4 weeks to optimize patient outcome (information based on the US package insert dated June 2002). Etanercept and adalimumab are given subcutaneously and can be self-injected. The FDA-approved dose of etanercept is 25 mg twice weekly, and of adalimumab is 40 mg every 2 weeks with methotrexate, or 40 mg alone. Medication adherence, possibly the most important factor in maintaining the benefits of anti-TNF therapy, is influenced by the interaction between the patient and his or her healthcare team, the patient's attitude toward the disease and medication regimen, and the choice of therapy. The introduction of tumor necrosis factor (TNF) antagonists has been a major advance in the treatment of patients with rheumatoid arthritis (RA). These agents have been shown to significantly decrease pain, joint swelling, serologic inflammatory indices, and rates of radiologic damage [1–6]. In addition, anti-TNF therapy has led to significant improvements in physical function and overall quality of life, as shown by improvements in Health Assessment Questionnaire (HAQ) scores and as determined by the Medical Outcomes Study Short-Form Health Survey (SF-36) [1, 5]. All of the TNF antagonists are administered parenterally [7–9]. Infliximab (Remicade®; Centocor, Inc., Malvern, PA, USA) is administered intravenously (IV) at an initial dose of 3 mg/kg at weeks 0 (baseline), 2, and 6, then every 8 weeks thereafter. In select patients, the dose can be increased to 10 mg/kg and/or the interval between infusions can be shortened to 4 weeks to optimize response to therapy . Infliximab is given in combination with oral methotrexate, usually in an office-based setting . Etanercept (Enbrel®; Immunex Corp, Seattle, WA, USA) is administered subcutaneously (SC) at a dosage of 25 mg twice weekly , and adalimumab (Humira™; Abbott Laboratories, Abbott Park, IL, USA) is planned for SC administration at a dosage of 40 mg every 2 weeks with methotrexate . Etanercept and adalimumab are primarily self-administered at home, provided that the patient has no functional limitations. The difference in routes of administration and dosing regimens between infliximab, etanercept, and adalimumab raises the question of whether these differences affect adherence to therapy and therapeutic outcomes. To explore this question we examine the experiences of patients with chronic disorders other than RA. Studies have indicated that the TNF inhibitors seem to have equivalent short-term efficacies despite the different routes of administration. However, it is believed that long-term effectiveness is probably influenced by adherence to the drug regimen, and poor adherence to long-term therapies can severely compromise the effectiveness of treatment . Efficacy (the extent to which a specific intervention produces a beneficial effect under ideal conditions) is based mainly on the pharmacologic effects of a particular therapy, whereas effectiveness (the extent to which a specific intervention produces a beneficial effect when used in the community) takes into account many other aspects, including patient characteristics, health system attributes, and societal factors [11, 12]. Treatment adherence in patients with RA has not been well studied, but a review of adherence rates to treatment regimens for other chronic diseases might provide a logical point of comparison. Among adults and children who have hypertension, asthma, HIV infection, and depression, adherence rates to treatments average 50% worldwide (Table 1) . Data from the World Health Organization . Adherence, or the lack of it, depends on four factors: (1) the healthcare team, (2) the disease, (3) the patient, and (4) the therapy . Polypharmacy (the prescription of many drugs or ingredients) has been shown to reduce adherence, especially in the elderly . Patients who take several drugs or drugs with multiple dosing or complex regimens are less likely to take their medications than are patients who take fewer drugs or drugs with simpler regimens. Provider inconsistency, in which the patient sees a different physician at each visit, can also limit adherence. Accessibility to physicians and their healthcare staff will enhance adherence to treatment, as will adequate patient education. Very limited data are available about the effect of pain and disability on adherence to therapy in patients with RA . Studies of other chronic diseases such as asthma suggest that symptom severity might not correlate well with adherence to therapy . Pain, stiffness, and physical deformities could be relevant if they significantly affect the ability of the patient to self-inject required medications. Three patterns of treatment non-adherence have been observed in patients: (1) erratic non-adherence, often due to forgetfulness; (2) unwitting non-adherence, due to a limited understanding of the treatment regimen; and (3) intelligent non-adherence, in which the patient's health beliefs prompt a conscious decision not to adhere to the treatment. Asthma studies in which medication dosing is monitored electronically reveal large discrepancies between self-reported and recorded medication use. Similar discrepancies exist between patient and physician reports of medication use [16, 17]. In one pediatric asthma study investigating the self-administration of β-agonists, inhaled steroids, and cromolyn, respective discordance rates of 20%, 67%, and 50% were observed between parents' reports of their children's medication use and the physicians' actual prescriptions . Poor understanding of the purpose of a medication can also lead to limited adherence. A Canadian survey of 603 patients with asthma was conducted to determine patient perceptions of the role of inhaled corticosteroids in asthma . Results showed that a considerable number of asthma patients did not understand how corticosteroids work. Between 41% and 43% of patients believed that corticosteroids acted to open the airways and relieve constriction (which is not true; bronchodilators do this), whereas only 22% to 24% of patients in this study believed that corticosteroids reduce inflammation or swelling of the airways (which they do) . Four factors in patients that have been associated with poor adherence are denial, disruption, depression, and dementia. In cases of denial, the patient often believes that he or she is not sufficiently ill to warrant the prescribed therapy, which leads to diminished adherence. Disruption describes any factor, such as a personal or family crisis, that interrupts the patient's daily schedule and therefore his or her medication regimen. Depression often manifests itself as apathy and not caring about getting well, and dementia frequently precludes a patient's ability to follow a prescribed regimen. The adverse event profile of a therapy, the cost of therapy and, potentially, the route of administration influence patient adherence. In addition, failure to respond to a therapy can limit patient adherence. Unfortunately, the long-term efficacy and effectiveness of a drug can be underestimated because of poor patient adherence . Future research will need to focus on RA-specific factors that affect long-term adherence and the use of monitoring methods (such as direct observation, electronic monitoring, random home visits, syringe counts, or self-reporting) to assess patient adherence to injectable drugs. Specific aspects relating to the route of administration include the onset of efficacy, immunogenicity, and patient preference. Commonly cited advantages of SC and IV dosing are listed in Table 2. Because many SC injections are self-administered, an advantage of SC dosing is patient control over when and where the patient will receive his or her medication, and a lack of associated (namely office-related) costs. In fact, physicians may prefer SC dosing for patients who would otherwise have to travel a long distance to receive an IV infusion. A disadvantage of SC dosing is limited flexibility; patients must adhere to specific incremental dosage increases. There is no flexibility in the dosing of etanercept . It is not known whether there will be flexibility in the dosing of adalimumab. 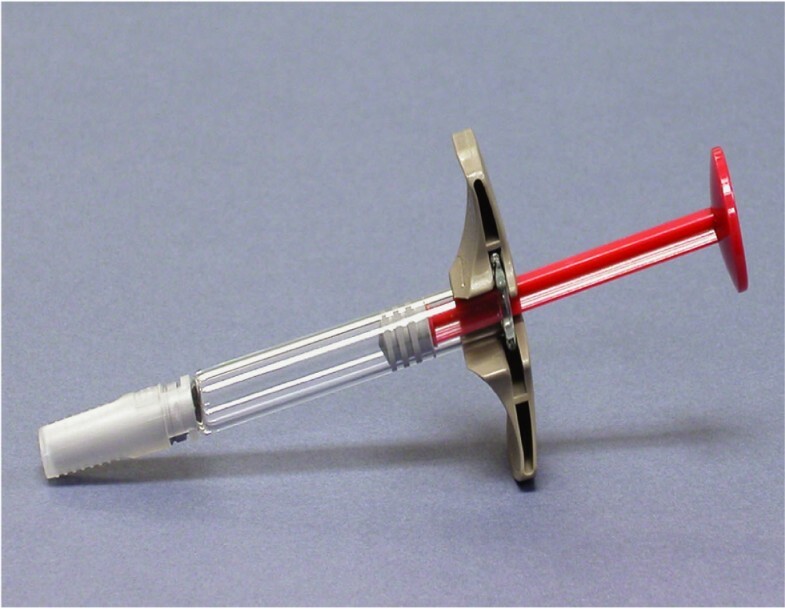 In addition, there can be functional limitations to SC dosing, because not all patients are physically able to inject themselves, possibly as a result of progressive RA. Attempts to overcome these limitations include the development of syringes with bigger wings and larger caps, and preloaded syringes that do not require reconstitution of the medication (Fig. 1). These modifications are expected to be introduced with adalimumab (data on file, Abbott Laboratories). Syringes with bigger wings and larger caps are designed to make the self-administration of medication easier. The scientific literature suggests that the likelihood of an immune response to a biologic agent is greater after SC administration than after an IV infusion . However, the rate of anti-product antibody formation, allergic reactions, efficacy, and the incidence of autoimmune syndromes (for example, systemic lupus erythematosus) after SC administration remain to be determined. IV dosing allows continuous dosage adjustments to be made, affording flexibility in matching patient needs at any given time during the infusion and helping to optimize overall treatment outcomes. One of the early RA trials with adalimumab evaluated IV and SC dosing, with double-blind and open-label phases (Fig. 2) (data on file, Abbott Laboratories). In the blinded phase, 54 patients were randomized to receive the study drug IV or placebo SC, the study drug IV or placebo IV, or the study drug SC or placebo IV, with a 3-week washout period for non-methotrexate disease-modifying antirheumatic drugs; the second injection was given at the same dose by the same route after initial response had faded (no sooner than 4 weeks after the first injection) (data on file, Abbott Laboratories). The efficacy of adalimumab (D2E7), as determined by tender and swollen joint counts, could be recognized within 2 weeks when the agent was injected intravenously (IV) but not until 12 weeks when injected subcutaneously (SC). Baseline values were standardized to 100%. Data on file, Abbott Laboratories, Abbott Park, IL, USA. In the open-label phase, patients were given the study drug SC and were followed for less than 18 months (data on file, Abbott Laboratories). Overall, the IV and SC dosing with adalimumab showed similar results in efficacy endpoints (namely American College of Rheumatology [ACR]20, ACR50, and European League Against Rheumatism [EULAR] responses) (data on file, Abbott Laboratories). In terms of tender and swollen joint counts, the IV group showed a more rapid response than the SC group, whereas the placebo group showed no adequate response (data on file, Abbott Laboratories). In terms of reimbursement issues related to the use of anti-TNF agents in RA, IV dosing might hold an advantage over SC dosing, especially in patients with Medicare coverage. Generally, coverage for drugs and biologic agents is provided by Medicare only if such agents (1) meet the definition of drugs/biologics, (2) are of the type that cannot be self-administered, (3) meet all general requirements for coverage of items as incident to a physician's services, (4) are not excluded as immunizations, and (5) have not been determined by the US Food and Drug Administration to be less than effective . When selecting a TNF antagonist, the patient's preference for route of administration is a significant factor. Jarry and colleagues  conducted a literature review based on MEDLINE searches to assess the expected compliance profiles of infliximab and etanercept in patients with RA. Data about compliance for all parenterally administered medications in patients with RA and other illnesses were reviewed. In general, compliance was noted to be poor in patients with RA regardless of route of administration. In patients with illnesses other than RA, treatment by means of assisted IV infusions had higher compliance rates than self-administered SC injections. A survey that asked which route of administration for anti-TNF therapy was preferred by Canadian patients with RA was also conducted. 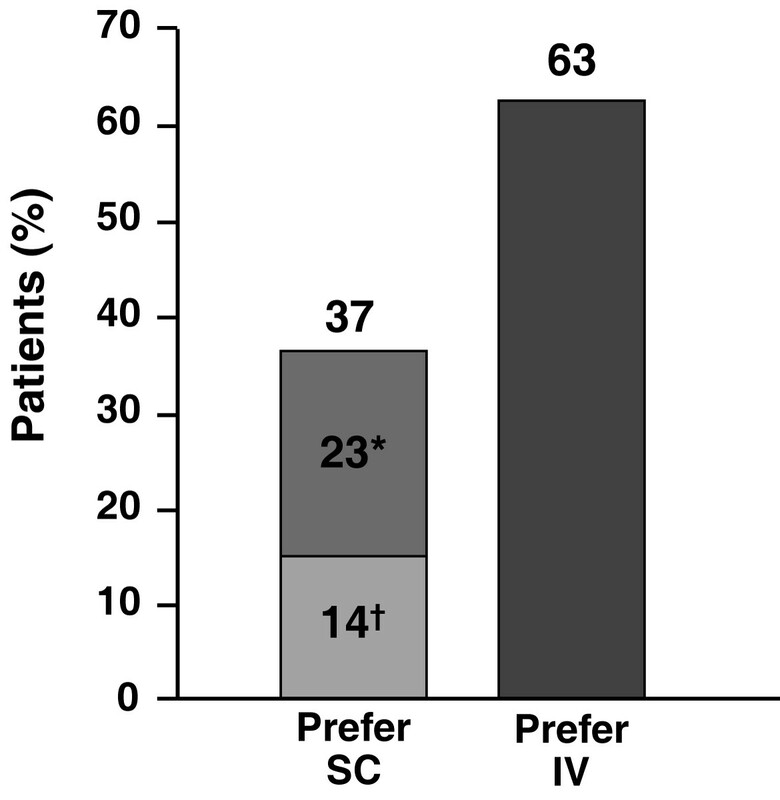 Results indicated a preference for IV administration (that is, with infliximab) over an SC regimen (that is, with etaner-cept). In this survey, factors for this preference included patients' general dislike of SC injections, pain and irritation at the injection site, more frequent administration of the SC-administered drug (etanercept), difficulty in handling secure medication containers, and the clinical assistance attendant on IV administration (Fig. 3) . In a survey of 141 patients with rheumatoid arthritis, 63% indicated a preference for the administration of medication intravenously (IV) and 37% indicated a preference for administration subcutaneously (SC). *Preferred someone else to inject the medication. †Preferred self-injection. Adapted, with permission, from . In a study by Tice, more than 95% of outpatients receiving antibiotics for an infectious disease reported a preference for IV administration . In addition, it was reported that 70% of cancer chemotherapy is administered IV in an out-patient setting. The most common setting for the administration of infliximab is in community-based or academically based clinics. Other settings include the outpatient section of a hospital, independent free-standing infusion units, and the patient's home, although most infliximab infusions are administered outside the home. Some hospitals are introducing immune-mediated inflammatory disease (IMID) centers, where various types of disease (for example rheumatic, metabolic, gastrointestinal, ophthalmic, neoplastic, hematologic, and infectious) are managed with IV medications in a single setting. Healthcare workers who administer IV medications should be familiar with the toxicities that can occur after infusing any IV agent and should be able to manage these reactions. Other methods of ensuring safety include the adherence to standardized protocols for the infusion procedure; patient assessments before, during, and after the procedure; and careful follow-up. Ancillary benefits of IV therapy include continuity of care, better patient education, peer support, and access to other medical specialists and support staff (such as social workers, nutritionists, and occupational/physical therapists). In clinical trials the TNF antagonists infliximab, etanercept, and adalimumab seem to have equivalent short-term efficacies despite the different routes of administration of these agents. However, the long-term efficacy of the TNF antagonists in patients with RA is significantly influenced by the degree of adherence to the therapeutic regimen. Factors influencing adherence include the healthcare team (for example, interaction with the patient, patient education), the disease itself (for example, symptom severity), the patient (for example, attitude toward therapy), and the therapy chosen (for example, potential adverse events, cost, route of administration). Does the route of administration influence the outcomes of anti-TNF therapy? There are indications that it might, although this question needs to be evaluated qualitatively and quantitatively by further research. SS is a speaker for Centocor, Abbott and Boehringer. GJM is a consultant for Centocor, and on the Speaker's Bureau for Abbott and Centocor.